Jim Whittaker, internationally renowned mountaineer, adventurer and environmentalist, is best known as the first American to summit Mt. Everest, on May 1, 1963. A visionary business and community leader, Jim was the first full-time employee of one of the country’s largest outdoor retailers, Recreational Equipment, Inc. – REI – retiring as its President and CEO after 25 years with the company. Jim is a talented and inspirational public speaker, who has given presentations to hundreds of corporations and organizations for more than four decades. He has led numerous, high-profile climbing expeditions, including the first ascent of Mt. 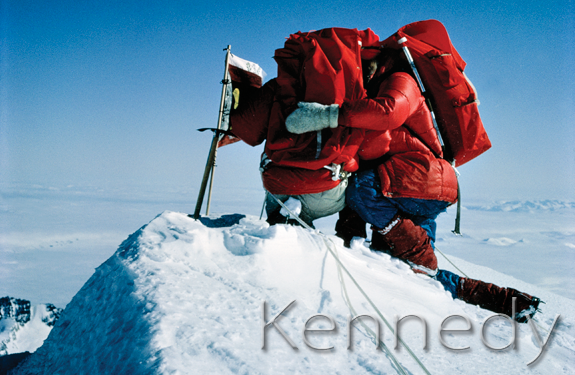 Kennedy (with Senator Robert Kennedy) in the Canadian Yukon in 1965, the first American ascent of K2 in 1978, and the spectacularly successful Mt. Everest International Peace Climb in 1990. He is an accomplished blue-water sailor, having twice skippered his own boats on the 2,400-mile Victoria-to-Maui International Yacht Race. He and his wife Dianne Roberts, along with their two sons, made a four-year, 20,000-mile Pacific sailing journey to Australia and back to their home in Port Townsend, Washington, aboard their 54-foot steel ketch, Impossible. Jim is the author of the best-selling, award-winning memoir, A Life on the Edge: Memoirs of Everest and Beyond.